Young boys love to imitate the men in their lives, for better or worse. During the early years of our countries existence when militia musters were a part of community life, the drum would have played a prominent role in the marching of the militia. Later, when units were being formed, the drummers again stood out as prominent and obviously important members of the company and someone to be imitated. These two drums are reproductions of drums that a boy might have played with during the 19th century. Both are made by a firm that made drums for use during the civil war. 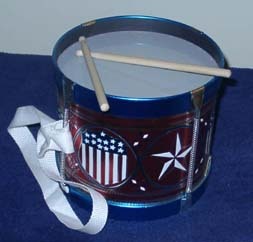 The one on the left, the Marching Drum, is a duplicate of a stamped tin drum that was produced in the 1880's. 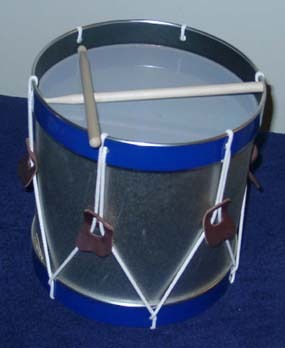 While this drum was made too late for authentic use in civil war living history, if a young boy really wants to have a relatively good quality drum, this one is also less expensive than the field drum (we understand such things. We are parents, too). The drum on the right, the field drum, is more like the tin shell toy drums of the 1860's. It even has leather "ears" that can be pulled down to put tension on the head and slacked for storage. If used for living history, the user may wish to replace the strap with a rope or leather strap. Both drums come with a pair of drumsticks. Also, because the drum tilts when worn just like a full-size snare drum, please have a marching drummer show the boy (or girl) how to hold the sticks properly.